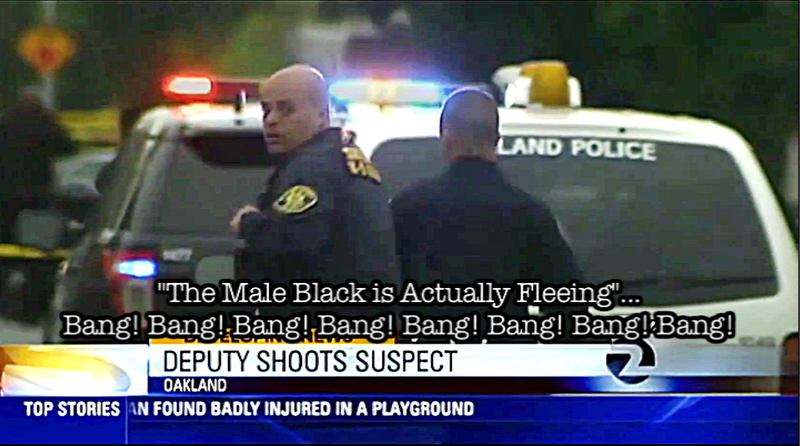 Oakland Police Radio: “And the male black, he actually fleeing. .” and then 8 shots. Oakland Police say the vehicle and Jacorey Calhoun, 23, the person driving it, matched the description of an armed robber from an incident two weeks ago. Oakland Police claim they initially tried to stop the vehicle. An alleged chase ensued, ending in deep east oakland with the car being abandoned and a hours to house search being conducted. An Alameda Sheriff and their K-9 assisted in the search and just before 6 am they found Jacorey and shot and killed him. According to the dispatch, Jacorey was fleeing at the time shots were fired. You can hear “And the male black, he actually fleeing. .” and then 8 shots. According to Attorney John Burris who is representing the family, Jacorey was unarmed and shot in the head. Like Oakland Police, Alameda Sheriff’s are now equipped with Body Cameras. Anyone have bets on whether that video comes up missing? Comments Off on Alameda Sheriff’s Murder Again?